Conventional turfgrass is a large consumer of water, wasting up to 50% of our clean drinking water according to the EPA. A modern toilet uses 6 gallons per day, but your average lawn uses 2,500 gallons per day. Plus, it adds significantly to your water bill, as those who have irrigation systems are acutely aware. Your lawn can also be a cause for a higher Water Efficiency Rating Score (WERS)®. 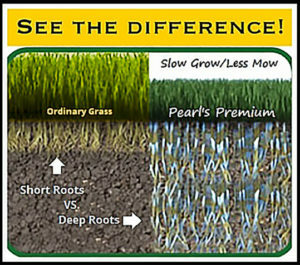 That’s why the Green Builder® Coalition has partnered with Pearl’s Premium via the WERS – Manufacturer Program to provide a 20% discount on their award winning mixtures of sunny, shady, and sun/shade grass seed, when buying at www.PearlsPremium.com and putting in the discount code “WERS20”. “In some areas of the United States, a lawn is a luxury that few can afford due to both the cost of water and the intense consumer of time: mowing weekly. In some places, it’s just environmentally irresponsible,” exclaimed Mike Collignon, Executive Director of the Green Builder® Coalition. 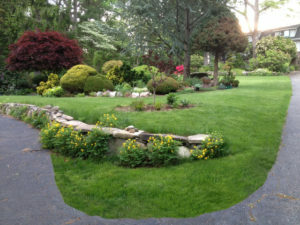 “My hope is that people consider this product as a way to have the best of both worlds; a beautiful lawn for themselves and their family, but with a very small ecological footprint.” Collignon went on to say he planted some of Pearl’s Premium in his own backyard, and within 7 days, it sprouted and now looks great. Pearl’s Premium Ultra-Low Maintenance Lawn Seed is a patented, extreme drought-tolerant grass that delivers breakthrough performance. Because it grows very slowly, it only needs to be mowed once a month, rather than weekly. It grows very deep 4-foot roots rather than 3 or 6-inch roots, so a homeowner will be able to cut turf watering by 75%. From the deep roots, it never needs lawn chemicals to out-compete most weeds and stay green year-round, so it is safer for children, animals and the elderly. Rather than chemicals for nutrients, Pearl’s Premium Grass needs small amounts of safer organic fertilizer or compost applied only once or twice a year. From the 4-foot deep roots in the ground and more surface area above the soil, this grass sequesters 8 X the carbon, pulling it out of the air to lock into the soil, to actually help lessen climate change and extreme weather. Its roots do not spread sideways, so there is no weeding of the grass out of flower or vegetable beds. It is dark green, barefoot soft, Non-GMO and fairly weed free. Pearl’s Premium has had over 300 rave reviews by experts & is sold at select Whole Foods. Pearl’s Premium gives back, donating seed to Habitat for Humanity & other causes related to children, animals & environmental education. For more info and to purchase, visit www.PearlsPremium.com or call (508) 653-0800.